Samantha Lane is an award winning journalist who sits on the broadcast team for Channel Seven’s coverage of the AFL. Previous she has rubbed shoulders with some of the best comics in Australia on Network Ten’s Before the Game. Given she didn’t take to either watching or playing much sport growing up and has degrees in Politics and French, it’s amazing that she became a Quill award winner and AFL Player’s Association football writer of the year. First covering AFL at Melbourne University, Samantha now appears across all the major mediums: print, radio, television and online. She has the versatility to be able to write a hard hitting headline piece on the back page or a heartfelt feature story. Samantha has covered wide range of events for Fairfax: the 2008 Beijing Olympics, 2006 Commonwealth Games in Melbourne, Australian Open tennis and spring racing carnival. She is also The Age’s cycling reporter, recognized for her coverage at the 2009 Cycling Awards. As a teenager Samantha developed a love for AFL side Carlton and wrote to the editor of the Club’s quarterly publication and convinced him to take on a casual writer. This led to roles with afl.com.au and then The Age. In 2003 Samantha was offered a position on a new nationally televised football panel show After the Game alongside Peter Helliar, Dave Hughes and later Mick Molloy and Lehmo. The show delivered football news, interviews and a fair dose of humor. The program was reborn as Before the Game the following year and achieved great success. Following changes to the AFL’s broadcast partners, Samantha joined Channel Seven as part of the Saturday night broadcast team. 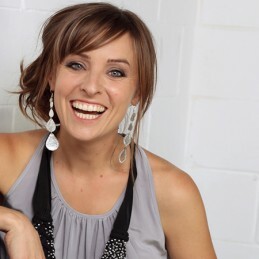 Samantha is a member of the ABC Radio’s football commentary team and hosts weekly pre-match show The Sunday Inquisition with Gerard Whately and Stan Alves. She was also a regular on Melbourne community radio 3RRR talking football and life. Samantha sits on an advisory committee to the Melbourne Vixens and is an ambassador for the Basil Sellers Art Prize and Run Melbourne. She also has ambassadorial roles with Breast Cancer Network Australia and the Women for Carlton. As either a keynote speaker, MC or panel member, Samantha is a natural and engaging presenter for any topic and is suitable for audiences ranging from corporate to school age.